Luxury Fincas & Villas for Sale in Palma | Montemar S.L. Palma de Mallorca is known all over the world to most people - Mallorca is very popular everywhere as a holiday island, party mile and nature paradise in the Mediterranean Sea. 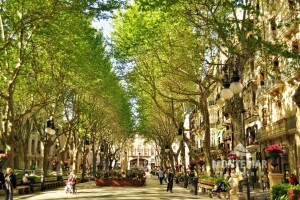 In the Catalan language Palma is also called Cuitat de Mallorca. The political and economic life of Mallorca (and the other Balearic Islands) has its centre here, as well as tourism. The town itself was dominated by its builders, the Romans, but also by all the conquerors who followed after them, including the Vandals, the Byzantines and the Catalans. The capital has preserved its buildings in many styles of different epochs - an architectural hodgepodge, where you can never get tired of seeing each other. Trade flourished through the city's harbour and fishing boomed long before tourists conquered the island. Far away from the overcrowded beaches, behind the former city wall there is an "old" historical palma, in which time seems to stand still. If you live in and around Palma, you have all the shopping possibilities in all price ranges, from kitsch to art, from "clothes" to noble boutique. The sandy beach, the Playa de Palma is 9 km long and probably the most notorious club and party mile on this planet. In the midst of a capital city with perfect infrastructure, many international schools and a charming environment, you will soon be able to own a villa or finca. Montemar Real Estate knows all vacant properties and surely has the property to suit your needs in its portfolio. Convenient, reliable and, thanks to years of experience and knowledge of the area, an ideal partner for you.